Keeping a lawn healthy, beautiful, and well-nourished can be a big job. Providing the right balance of support plants, moisture, soil type, and shade is key, but even then, over time the soil beneath your lawn can become depleted of critical minerals that grass and other plants need to grow and thrive. Many fertilizers will list their mineral content as “N-P-K” followed by three numbers: respectively, these numbers represent the percentage of nitrogen (N), phosphorus (P) and potassium/potash (K) they contain. Nitrogen helps plants develop a vibrant green color and healthy leaves; phosphorus aids in the root, seed, and fruit/flower development; and potassium, also known as potash, helps plants to develop strong stems and can boost maturation and growth. As all plants, from grasses to fruit trees, have all of these basic structures, the right combination of N-P-K is good for all your green garden-dwellers! It’s that time of the year when many consumers are preparing their lawn in hopes of ushering in a verdant green lawn. When it comes to treating your lawn, it’s critical that you use the absolute best lawn fertilizer. In efforts to assure our readership and provide even more comprehensive information on the topic, we performed an update on this buying guide. 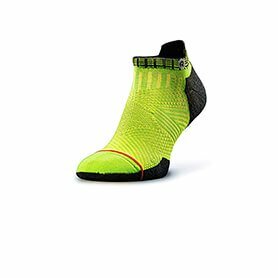 Included below, you will get exclusive access to learn about our process of evaluation and the criteria used to measure each product. Additionally, we answered some of the most commonly asked questions to make your decision process that much easier. 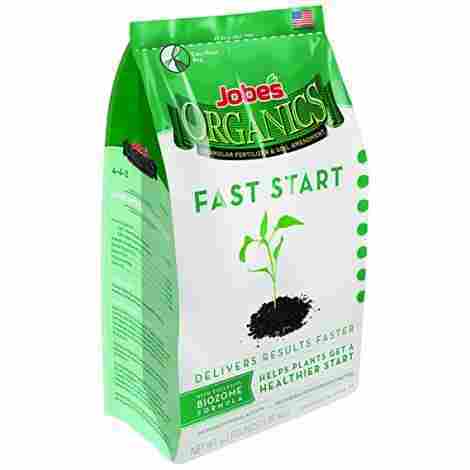 If you need a reliable, organic, dry fertilizer, Jobe’s Fast Start 4-4-2 is a great place to start. With Jobe’s Organics, you’re getting a pesticide-free, a food-grade fertilizer that’s safe for children and pets and can be used on a variety of plants and grasses! Jobe’s Organics Fast Start is USDA certified organic, meaning it contains no pesticides, and then this product is also safe for food-grade crop growth. Suitable to use around children and pets, you can supplement your garden or lawn, or get a new project going, without having to worry about hazardous and toxic chemicals. Fast Start contains Jobe’s Organics proprietary Biozome, which assists new plantings with root growth and seed development. A blend of mycorrhizal fungi, good bacteria, and beneficial Archaea microorganisms, Biozome contributes to root length and surface area, while removing harmful microorganisms from the surrounding soil. Archaea is relatively new to the fertilizing world, highly prized for its ability to survive in extreme environments like ocean-floor hydrothermal vents, so its inclusion in the Biozome formula brings its symbiotic potential to your lawn environment. Fast Start has a very low price for such a high-quality product and will be an excellent addition to your garden, lawn, orchard, or another green outdoor project. Its USDA organic certification makes it not only inexpensive, but very safe to use, and it provides multiple, complementary growth boosters that can help keep your lawn or garden green, vibrant, and healthy for years to come! With a proprietary blend of 11 nutrients and minerals, Osmocote Plus Smart-Release Plant Food is a pellet fertilizer that slowly releases into the soil, nourishing your lawn or garden for up to six months after application. Smart-Release technology means that you won’t overexpose your lawn or garden to excess nitrogen, so long as Osmocote is used as directed. Osmocote Plus is a pellet-based fertilizer that you apply directly to the soil where needed. It provides a proprietary blend of eleven minerals and nutrients and gives a nutritional boost to your lawn or garden for upwards of six months. 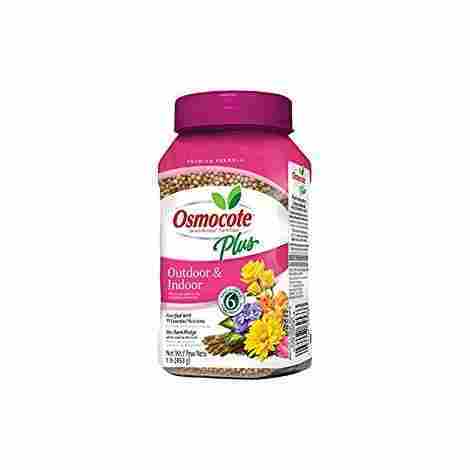 Osmocote Plus pellets dissolve on a time-release, allowing the nutrition your plants need to be delivered gradually; this product also carries a “no-burn” guarantee, so when it’s used properly you won’t have to worry about wilting leaves and stems due to nitrogen overexposure. While it comes in a small package, suitable for veggie gardens and smaller lawns, Osmocote Plus is a high-quality product that can yield long-lasting results. It is more of an investment, per pound than most fertilizers on this list, but when used correctly it fosters long-term yield and growth for your plants. With a high mineral content and a convenient liquid format, Miracle-Gro All Purpose Plant Food is a great addition to any gardener’s toolkit. This fast-acting liquid fertilizer is suitable for all plant types, and you can apply it as often as every 7-14 days for continued growth promotion. Mix the Plant Food into your watering can and apply as part of your normal water routine. This formula has a 24-8-16 NPK ratio, so it’s important to not overfeed your plants, but the high (24%) nitrogen content is excellent for root length and volume when used correctly. 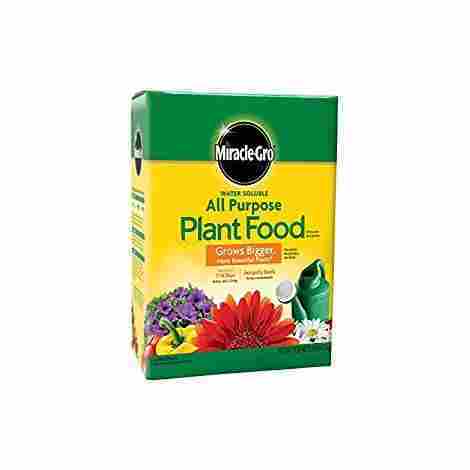 With an excellent price point and a well-established brand you can rely on, Miracle-Gro All Purpose Plant Food is a good buy for the investment. Its versatility means it’s suitable for most garden and lawn projects, too! 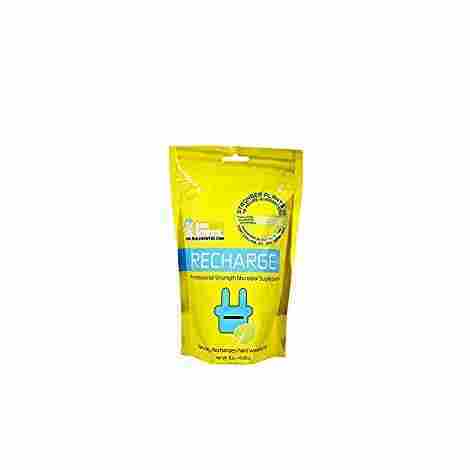 Real Growers Recharge is a little unusual for this list: rather than providing the direct infusion of minerals and other nutrients into the soil, Recharge adds a blend of plant and fungal microbes to your lawn or garden that promotes overall growth and health. Recharge is a growth formula made with plant microbes, mycorrhizal fungi, and Trichoderma fungi, which complement one another to improve soil quality, root health, and development. Fungal microbes and rooting plants develop mutually beneficial relationships that not only foster plant growth but can, over time, create a web of nutrient-sharing throughout your garden or lawn. They do so by breaking down organic matter in the soil, thereby making it nutritionally available to nearby plants. The Trichoderma microbes are also resistant to chemical fertilizers, so whether you’re making the switch from conventional fertilization or you want to supplement an existing plant system, you won’t have to worry about pre-existing fertilizers interfering with new growth. Recharge is a significant investment per weight, coming in close to the top of this list in price vs. volume, but it’s not an “ordinary” fertilizer. It gives your existing plant systems a boost without relying on harsh nitrogen salts that can burn leaves and blossoms. 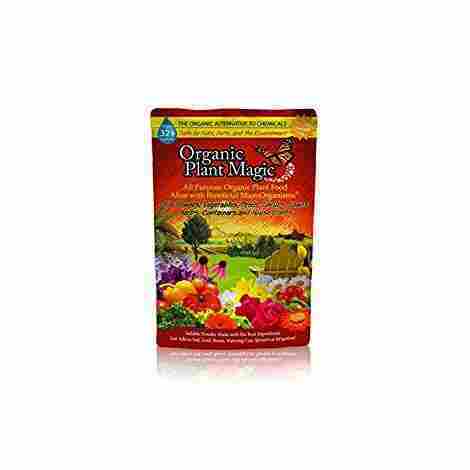 Plant Magic Organic Fertilizer is a “compost tea”, a composite of nutrients that you mix with water and then apply like you would any solid compost-based fertilizer. Versatile and certified organic, Plant Magic Plant Food is a welcome and pet-safe addition to your garden or lawn. Plant Magic Plant Food is an effective, organic nutrient booster and growth promoter for most plant types, both indoor and outdoor. Suitable for plants at all stages of growth, from seedling to mature, you can use Plant Magic Plant Food throughout your garden’s life cycle. Also known as a “compost tea”, you can add this directly to your watering can and it will dissolve quickly, making it perfect for adding to your normal gardening routine. Even better, as a compost tea, this product can replace the need to make and spread compost directly, which can be time-consuming. Plant Magic Plant Food comes in a small package, but you can spread out its use over many watering sessions, easily applying it to a much larger area than its 16-ounce size would suggest. More versatile than many of the fertilizers on this list, Plant Magic is suitable for new lawns, saplings, and newly planted bulbs and seeds. 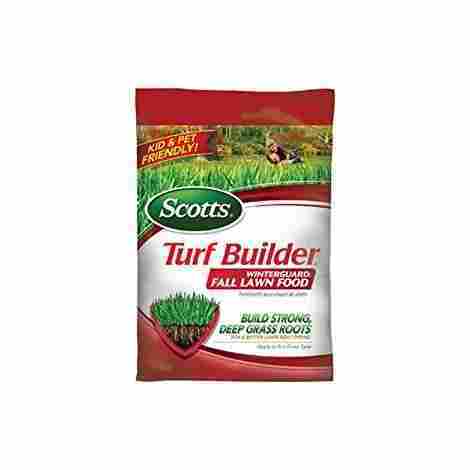 Scotts is a well-known and much-loved brand, and their line of Turf Builder lawn products has the right food for your grass. When your lawn has begun to enter its dormant state for the winter months, and you’re getting everything ready for freezing temperatures, try Winter Guard to help your lawn recover from warm-weather damage before you settle in for the season! Scotts Winter Guard Fall Lawn Food is a specialized fertilizer that nourishes and restores damaged, unhealthy grasses, as well as helping build deeper, stronger root systems that help your lawn to survive the cold winter months. Apply Scotts Winter Guard in the fall as part of your winter lawn and garden preparations, and help your grass make the most of available nutrients and moisture; come springtime, the results will wow you!. Scotts Winter Guard has a low price point for its 5,000 sq. ft. (or “5M”) spreading area. While it’s not as useful for flowers or vegetables, what it does, it does well: just add it to your fall lawn preparations and reap the results come spring! Can provide a “pick me up” to unhealthy or weathered lawns in the warm months too! SLS Advanced is easy to use and comes in its own handy applicator so you don’t have to spend a lot of time mixing and diluting the solution: just open the container and go! 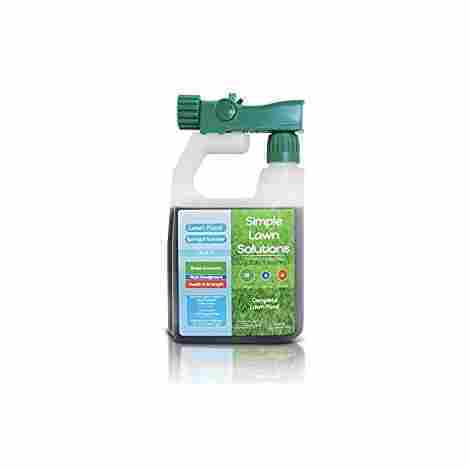 Simple Lawn Solutions Advanced comes with a 16-4-8 NPK ratio, ideal for nourishing a well-rounded growth profile for your plants, flowers, and other growing leafy friends. Advanced Liquid Fertilizer is ideal for use in spring and summer when your garden or lawn is in its period of high growth. Free of harsh chemicals, SLS Advanced supplements the mineral profile of your lawn turf, allowing well-watered grasses of all types to grow and stay healthy and strong during the warm months. SLS Advanced is a good bargain for the volume; like most liquid fertilizers, its relatively small (32oz) packaging holds enough plant nutrition for your whole garden or lawn! Used on well-watered grass during the growing months, this product can improve the longevity, root health, and overall robustness of your grasses, helping your lawn sink deeper roots that make it better able to nourish itself! Are you looking for a new, mineral-based fertilizer for your lawn, but you’re worried about excessive phosphates in your soil? Too much phosphorus in the ground can inhibit plants’ uptake of important micronutrients, like trace minerals, affecting their long-term health. To give your dirt a break, a nitrogen/potassium blend like SLS Superior Nitrogen & Potash could be just the thing! 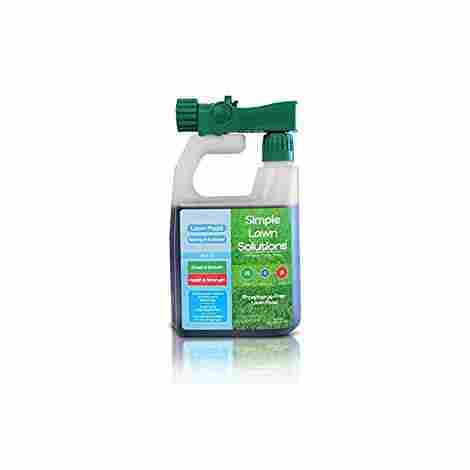 SLS Nitrogen & Potash is another mineral liquid fertilizer from Simple Lawn Solutions. If you want a fertilizer that focuses on root health and beautiful, vivid green leaves, look no further! Just connect the container to a watering hose, turn the nozzle, and begin refortifying your lawn. SLS Nitrogen & Potash is child- and pet-friendly and can help you restore undernourished grasses to good health. This product is useful in a variety of soil types, including sandy soil, and can help you keep your grass green and strong without relying on phosphates. With a lower price-point than the SLS Advanced due to its targeted, phosphate-free nutrition profile, SLS Nitrogen & Potash is a good bargain that can be applied to weak or damaged grasses again and again without dipping into your wallet. Weeding your lawn can be an exhausting, back-breaking process. As if it weren’t enough work already to keep your grass alive and healthy, a well-nourished lawn is a tempting target for weeds to encroach upon. Give your grass more room to grow by weeding and feeding at the same time! Scotts Weed and Feed is a dual-acting fertilizer that kills major weed species while nourishing the grasses and other plants you want to grow. 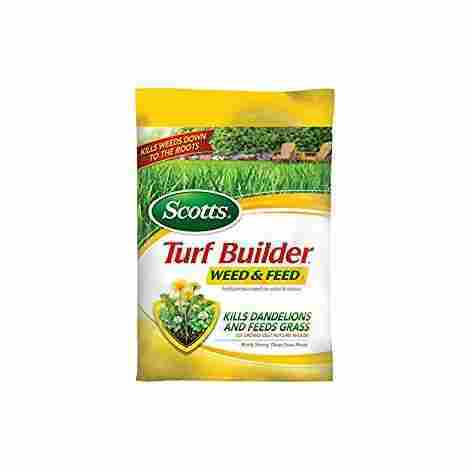 A single bag of Scotts Turf Builder Weed and Feed is good for 5,000 square feet of lawn: that’s almost as big as two tennis courts! More and healthier grasses in your lawn mean less moisture, space, and nutrition available for weeds to use, and a deeper, more stable root system. Deeper roots mean your grasses will be better equipped to handle inclement weather conditions and survive damage and severe temperatures. With a high price point for its volume, Scotts Weed and Feed is a bit of an investment, better used for weed-choked lawns than as a general-use fertilizer. At the same time, Scotts is a known and trusted name in the industry, so you know the quality you’re getting. 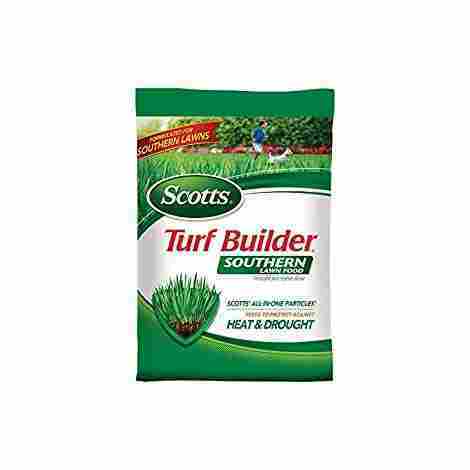 The Scotts Turf Builder line of products includes a special formula for the drier and warmer climates of the Southern United States. Turf Builder Southern can be applied to any type of grass in any season, making it a versatile addition to your lawn and gardening routine! Specially formulated for grasses growing in the southern United States, Scotts Southern Lawn Fertilizer is a quality product from a brand you know and trust. Apply to a wet lawn and watch the results appear over the next few days. Scotts Southern Lawn Fertilizer has a 26-2-13 mineral profile, so if you’re trying to limit the number of phosphates in your soil, this is a great buy. Apply to your lawn before watering or before it rains, and whether the dry months like never before. While this product has a fairly specialized use compared to most others on this list, if you’re trying to grow a healthy, beautiful lawn in adverse conditions, this could be your Gardener’s Helper! With a good price point for its 5M (5,000 sq. ft.) volume, Scotts Southern Lawn Fertilizer is a great product for what it does, but if you don’t live in a hot, arid, or subtropical region, there are many other excellent Scotts lawn fertilizers you can try instead. Lawn fertilizers replenish the soil, making growing conditions more favorable, and in addition to remineralizing, fertilizers can help with pH balance, add composted material to the soil for richness, and can even be tailored towards the specific needs of the grasses, flowers, shrubs, trees, and vegetables you want to grow. Available as the liquid, compost, dry pellets, or even nutrition “spikes” that you plant next to whatever needs a boost, lawn and garden fertilizers can help you develop the green space you’ve only dreamed about! Thanks so much for reading! There’s a huge variety of lawn and garden fertilizers to choose from; hopefully, now you have a better idea of what’s out there and what to consider for your next outdoor project. Whether you need a high-quality organic fertilizer for your veggie garden, or on a specialized growth booster for finicky or subtropical grasses, or you just want to find out how to keep your lawn healthy with the right minerals and other nutrients, now you have a place to start from. Good luck out there, and happy gardening! Now that we have discussed the top ten best fertilizers that an individual can buy today, we are eager to share the criteria that we used to evaluate the fertilizers. Our criteria act as a guideline for us to know how to choose the best products and items for our audience. With that said, we are eager to share the criteria that we used so our audience can better get to know our process and how we select the top ten. We do the research so you don’t have to! With that said, individuals can enjoy their gardening much more with these quality fertilizers. As our criteria, we can ensure that we took the deepest of care when picking out the top ten best fertilizers for our audience. Now, let’s begin with the first criteria we wanted to share that formulated how we would start the process, the overall quality of the lawn fertilizer. Why is a quality lawn fertilizer worth it? Well, the quality of a lawn fertilizer will determine exactly how well the lawn will grow and the flowers will bloom. With that in mind, we took into heavy consideration the overall quality of the fertilizer, this not only included the fertilizer itself but the consistency and all of the different elements of the fertilizer. To pick out the best fertilizers, we had to look at the ingredient list to better see exactly what the fertilizer is made out of. Our goal was not just to share the best quality fertilizers that had a quality ingredient content but also fertilizers that did not use any harmful substances and materials. As we move into a more conscience and health-aware state when it comes to our food, individuals are reading the ingredient list more often when it comes to fertilizer ingredients. With that in mind, we can say that some of the fertilizers on this list include some of the best mineral content to ensure the best quality when it comes to consistency, nutrients, and other aspects. With that, we wanted to share some of what we discovered when picking out the top ten. Many brands use a granule coating that consists of semi-permeable resin that is nutrient filled. These fertilizer brands offer plenty of different rich nutrient content to ensure and promote the healthiest of growth. With that said, one aspect that we wanted to take into consideration is that brands only included fertilizer that did not have any pesticides or GMOs, etc. Therefore, one criterion that we wanted to include to appeal to all kinds of buyers is whether or not the brand was organic or not organic. When it comes to growing food, individuals have different preferences and since planting has such a wide variety of available options, we wanted to consider both organic and non-organic foods. With that said, part of the reason this was an important criterion to consider is that of individuals preferences. If an individual prefers to plant organic, then we have shared brands such as Organic Plant Magic. However, some consumers are completely okay with using products such as Miracle Grow, which is also considered one of the better quality fertilizers. When it comes to fertilizers, however, many brands offer non-GMO, and other harmful chemical-free fertilizers that are intended for safe use. With that said, individuals can expect that many of these fertilizers offer the best possible quality consistency and organic and non-organic matter that will cause all plants to fruit. As one of the most important criteria to take into consideration, we wanted to evaluate the size of the cost. Many brands offer their fertilizers in many different sizes and depending on the quality of the fertilizer, the cost will go up. Therefore, we wanted to ensure that the fertilizer was built and designed with the best quality content matter in the bag for the price. Now, as one of the criteria, we looked for, the cost will go up depending on whether or not the material of the bag is organic or non-organic. With that in mind, individuals should expect the best quality for the cost of all the brands that are above. As another one of the most important guidelines we ensured to meet, we wanted to only showcase and share the top ten brands that offer quality assurance. With this in mind, many of the brands an individual will encounter on this list are often known because they can be found at hardware or department stores. However, we also wanted to share the lesser known brands that many people will overlook. The reason this was so important, so we could offer variety for our readers. As another important criterion that we considered, one important element that was crucial to us is the reviews. We read a lot of reviews when it comes to the best quality brands in the industry for lawn fertilizers. With that, the reviews helped us decide and realize which were the best when it comes to lawn fertilizers. We took aspects into consideration such as the strength of the scent, the power of the lawn fertilizer to offer maximum growth, and the consistency as well as the mineral content of the fertilizer. As the last fertilizer that we took into consideration, we wanted to offer maximum variety for our readers and so we focused a lot of our attention on finding unique brands that offer the results our readers are looking for. With that said, we did repeat about two of the same brands, Scotts Turf, and Simple Lawn because of their quality and variety. Now, as we come to a close for the best variety fertilizers, we want to share a bit of the most frequently asked questions. Q: How much fertilizer per water? A: This is one of the most frequently asked questions that is also one of the vaguest. The fertilizer per water really depends on the type of fertilizer that an individual uses. There are some fertilizers where it is about three tablespoons per one gallon of water, while other fertilizers do not need water but it is one tablespoon of fertilizer that needs to be spread in the dirt or inside the pot. Q: Do you have to dilute it with water? A: This is also one of the most common questions and diluting a fertilizer in water all depends on the brand and the instructions. If an individual dilutes too much then the fertilizer may not work properly, while not diluting enough can be a harmful chemical reaction for the plant. Q: Can I add it to a potted plant? A: This next question is one of the most common for individuals that have potted plans or container garden. With that in mind, container gardening plants require a specific type of fertilizer that is best suited for the tight environment of a container. With that in mind, it is always best to read the proper instructions on how to properly container garden. Q: Is the scent strong? A: As one of the most frequently asked questions, individuals want to know if the scent of the fertilizer is strong. Depending on the fertilizer, individuals can expect that the fertilizer will be very strong and cause a lingering odor. With that said, we recommend reading individuals opinions about the fertilizer odor and becoming familiar with what fertilizers have the strongest scent. Q: What do I use for acid loving plants? A: This is a great question for individuals that want to grow tomatoes or any type of citrus. The type of fertilizer that an individual uses on herbs is not the same type of fertilizer that they would use on acid-loving plants. Therefore, it is always best to read about acid loving plans and what they require when it comes to fertilizer.